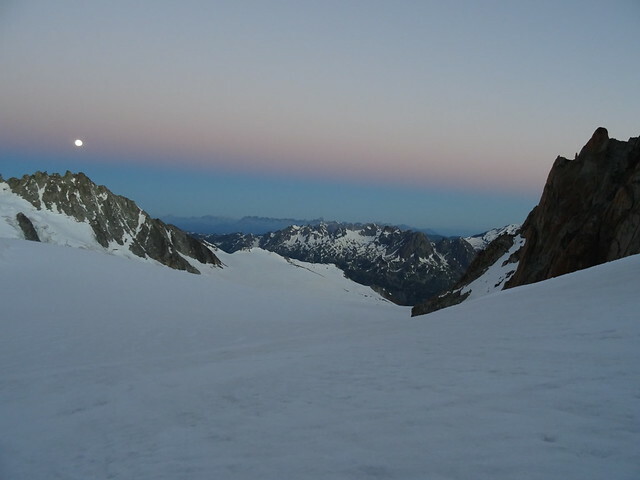 I’ll admit to a great deal of procrastinating about heading out for an over night expedition. 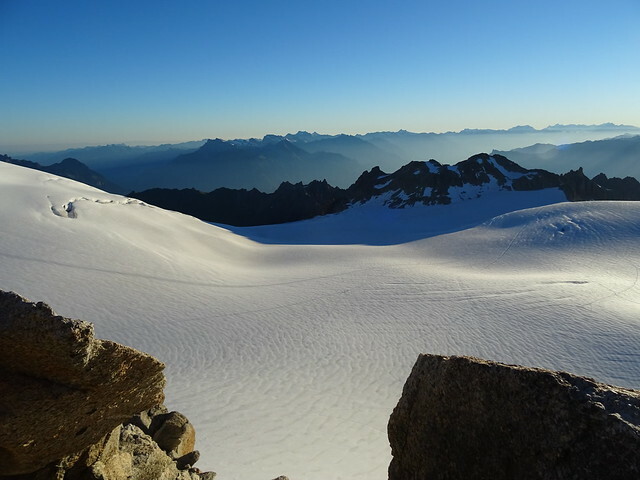 I love sleeping wild and love big adventures, but I also don’t like to put myself in situations where I can’t be self reliant and get myself out of a fix. I don’t like having to rely on others and not to be in charge of my own decisions. I’ve been in situations before with gung-ho individuals who won’t admit their lack of knowledge or skills, which is a nightmare when you are far from safety. 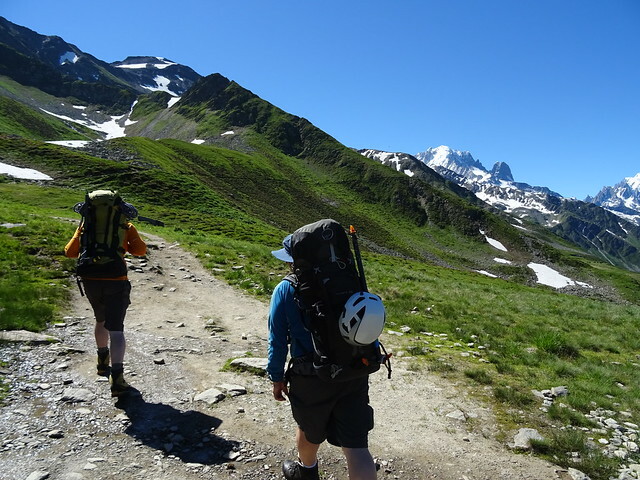 So the thought of being out with two eager friends (though they do know what they are doing) felt like it had all the hallmarks of me being led up a mountain and having no say in decision making, easily done when you’re all roped together – you can hardly have an argument and stomp off to do your own thing. 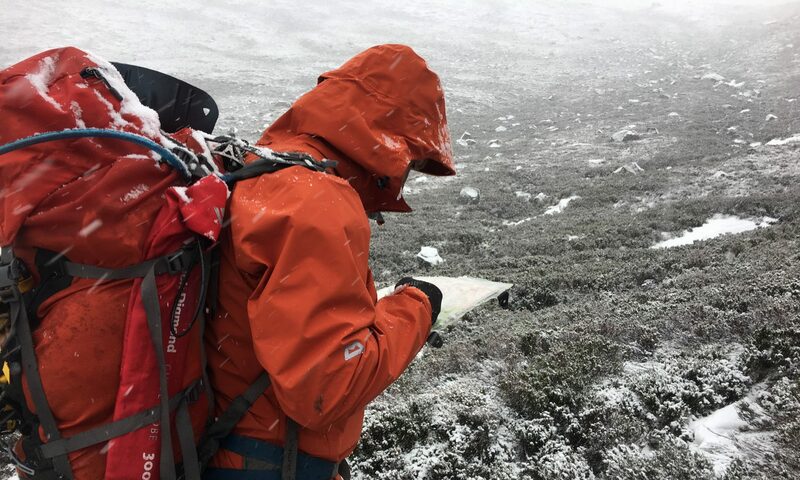 As it was, that proved not to be the case and whilst I might have started out feeling like a tag along, in the end I was just as involved in navigation decisions. 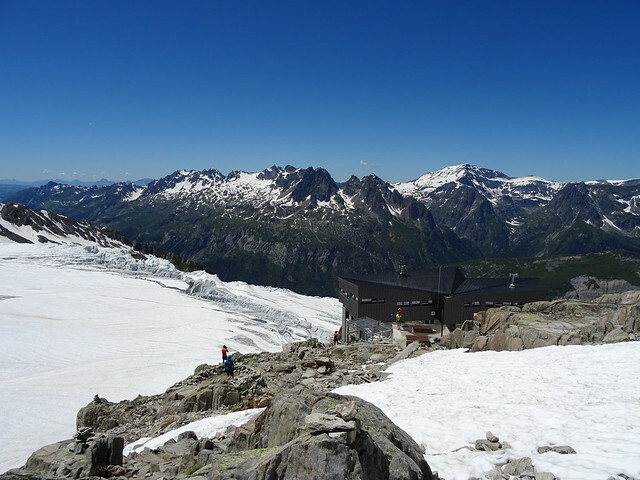 We took the cable car from Le Tour at the end of the Chamonix valley to head up to the Refuge Albert 1er, knowing full well that it was already booked up and we would have to bivvy out. 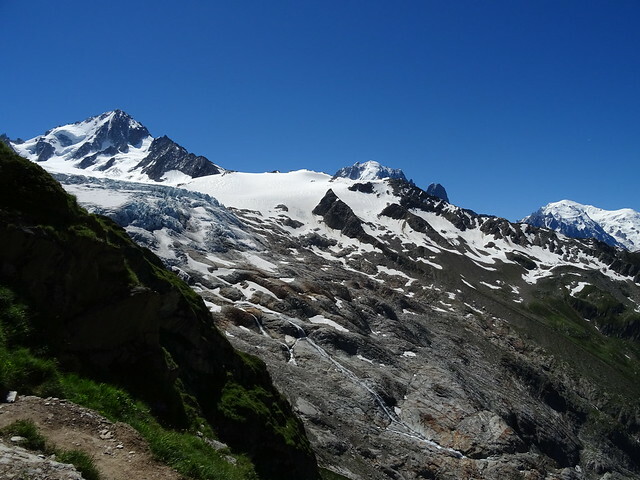 The walk is a two hour route that winds around the hillside from the Col de Balme and then ascends steeply to the refuge. It was a very hot day and it’s been a while since I’ve carried a full pack so I was definitely pleased to arrive and be able to get a cold drink and sit in the shade. 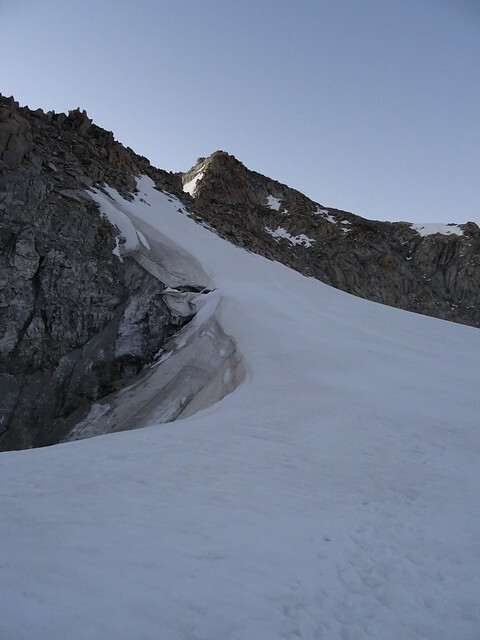 We originally found a great platform to camp out on just above the hut, amidst other bivvying on the rocks and snow. 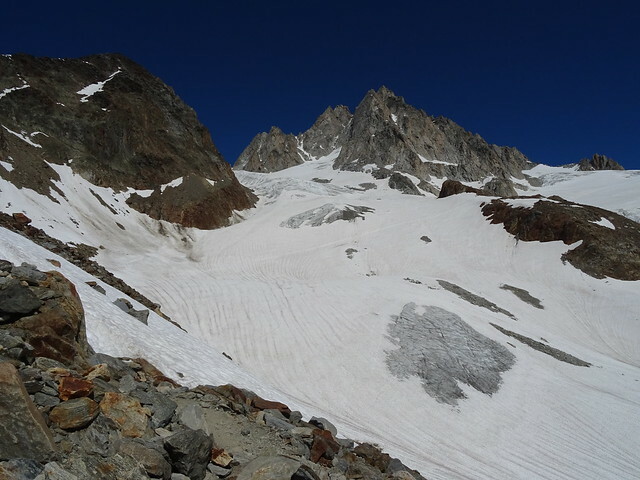 But after scoping out the route for the following day, we changed our bivvy spot to be closer to the glacier and past all the rocks which would be hard work in the dark. 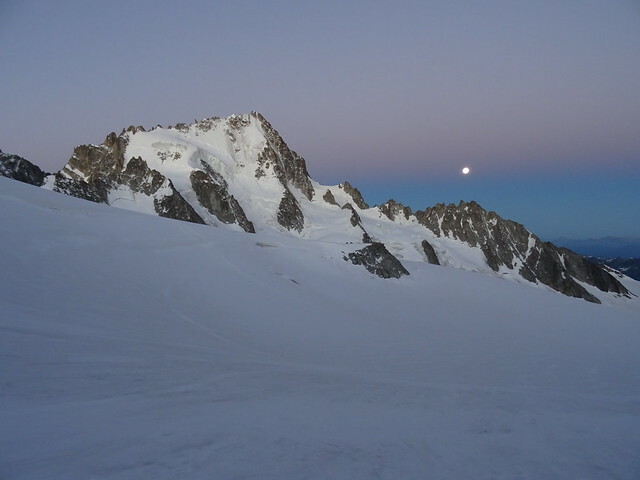 Below you can see the route we will take in the early morning – diagonally across the snow below the peak of Aguille de Tour. So after much debate we settled for sleeping on the snow. 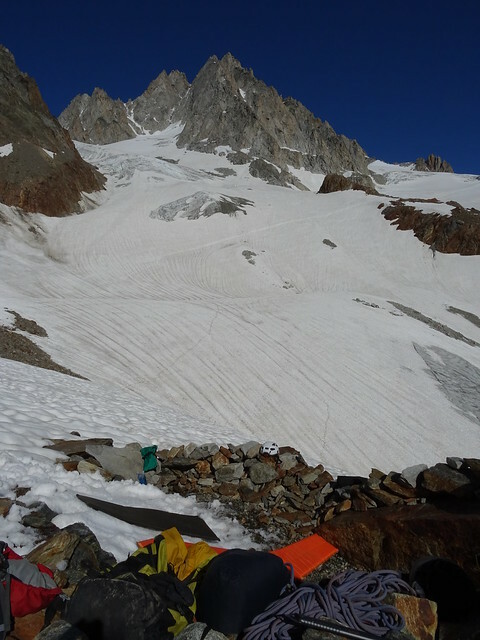 It was a fantastic spot to bivvy, with impressive views of Aguille de Tour and Chardonnet but it was impossible to sleep. First the sun blinding off the snow and then later the full moon. 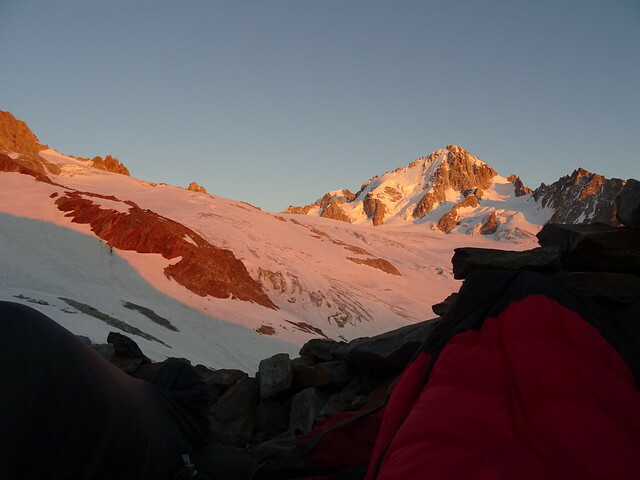 It was also incredibly uncomfortable as I kept sliding down to ball at the bottom of my sleeping bag. 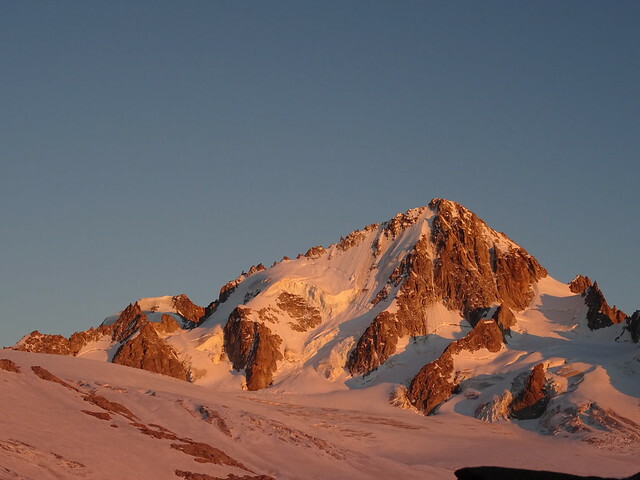 So with my sleeping bag pulled over my eyes I got a few hours sleep – although I did stick my head out for a few photos of the setting sun on Chardonnet. 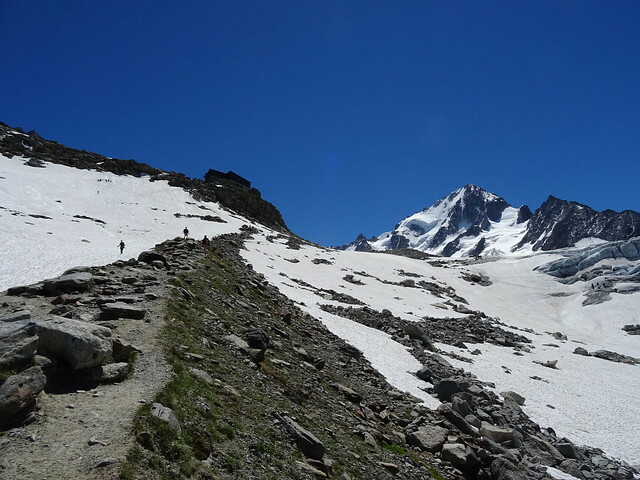 It was 2.30am when we set off across the glacier, with the intention of ascending Aguille de Tour, heading past it to cross a col and climb from the other side. After the decisions over route choice became a discussion, I had to admit my anxiety about not being in charge of my own destiny resurfaced. 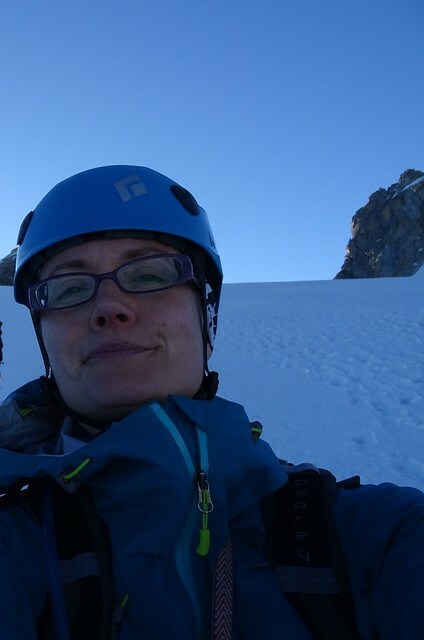 Thankfully I channelled it to problem solving and navigation – things that give me inner calm. So after ensuring we were all confident we were heading the right way and just had to keep walking, we found the right col to go over. Unfortunately we chose a gully too far left to try to climb which turned out to be full of loose rock; it was going to be slow progress. 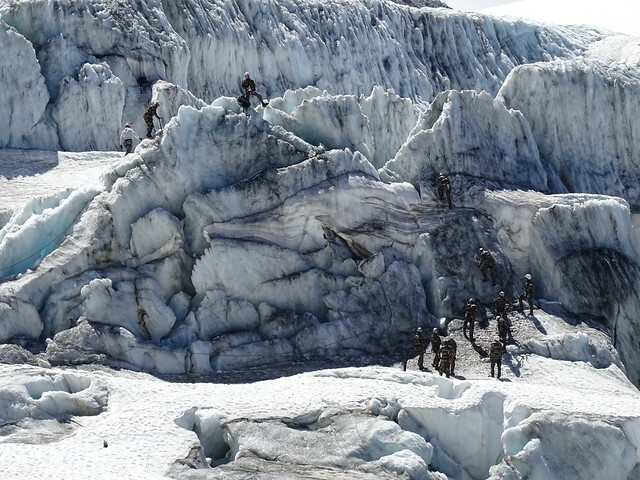 As it was, so much rock debris came down as our rope leader was ascending that it was clearly not a safe place to cross and we had chosen the wrong line. I had a near miss with a football sized rock, and so was grateful we chose to retreat. 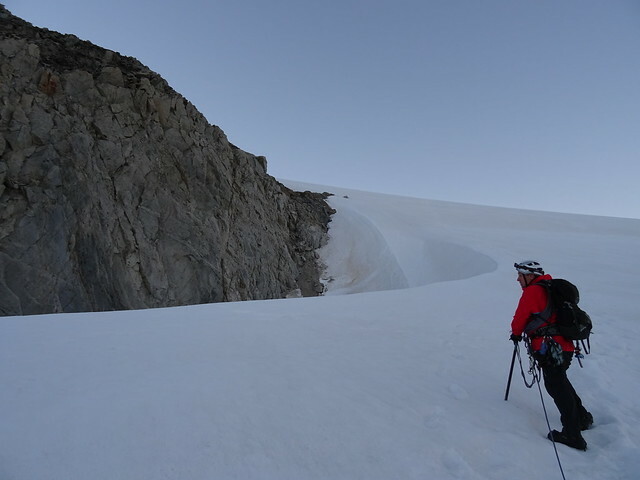 This is the route we should have gone up, although by the time we’d retraced our step and worked this out the crack in the ice didn’t fill me with confidence. 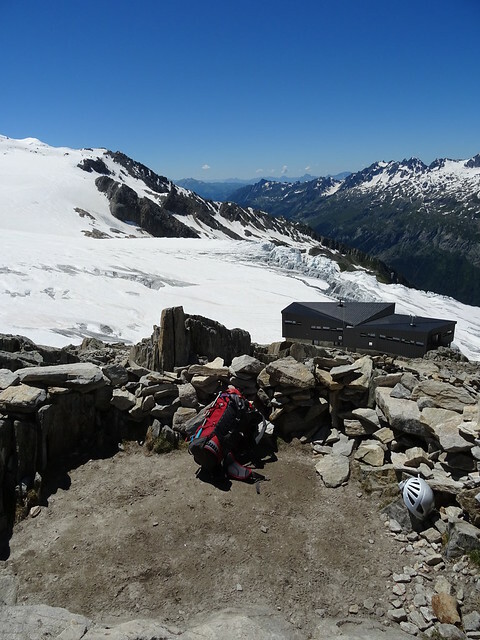 That said I was annoyed at a lost opportunity to have a go at a proper alpine peak. 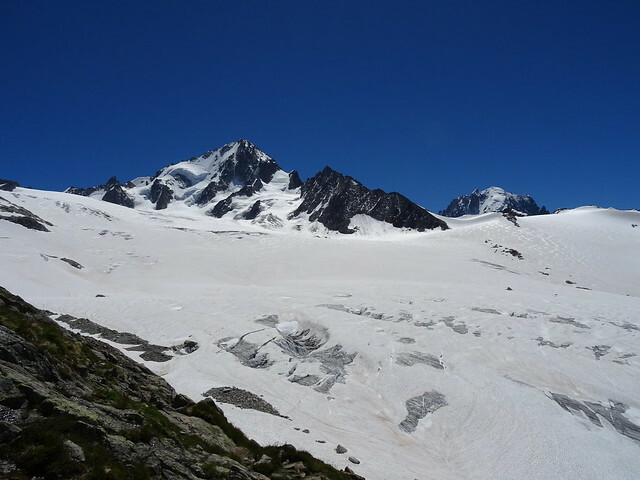 So after a debate we decided to head to nearby Tete Blanche, nowhere near technically difficult as it was merely a snow plod up to a scree summit. 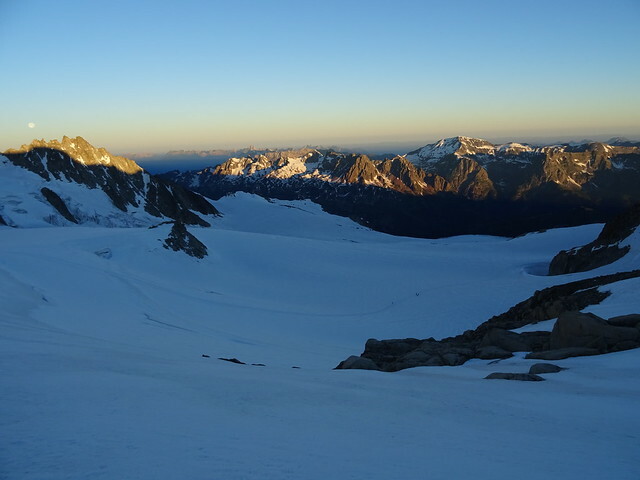 But, we did make it for sunrise over Switzerland and it was an amazing view and it is still 3429m high so worth the effort. The route was also a valuable learning experience. 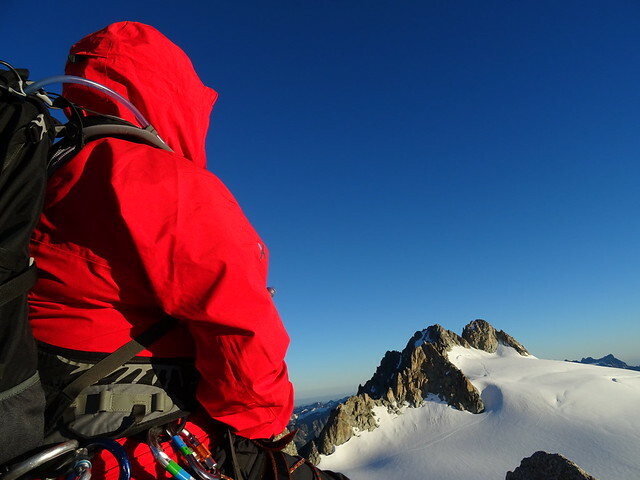 I learnt a valuable lesson to always trust my own decision making and navigation.I also learnt I need to get better at alpine climbing so I can lead. I am also even more committed to my project and despite it being summer still, I have already got myself signed up for the Winter ML. A tangent from my project perhaps, but one which will at least commit me to a winter of fun in the snow. I love snow! The pictures are absolutely amazing.